CUSHING, OK (Reuters) - From the air above this small Oklahoma town, the 300 steel oil storage tanks that dot the landscape appear filled to the brim, their floating lids bobbing atop more than 65 millions of barrels of oil. There may be no better place to witness what a world awash in crude looks like, and the 9 square-mile (23.3 square km)complex seems to bear out oil traders' fears that the industry is running out of space to contain a historic supply glut that has hammered prices. Such worries make weekly estimates of Cushing stockpiles from the Energy Information Administration one of the hottest market indicators. These inventories peaked in mid-March and have edged lower since then. Some traders reckon they are unlikely to exceed those records for years as refiners rumble back from seasonal maintenance and demand rises. Others warn the stockpile could rise again. Up close, from a 24-hour bunker that controls a quarter of tank space here, the ‘pipeline crossroads of the world’, reveals its secret - there is some spare room left. On March 24, the day after U.S. government data showed Cushing’s tanks held a near-record 66.23 million barrels of crude, Mike Moeller, manager at Enbridge, explained how the largest Cushing operator uses every last inch of usable space. Operators and technicians make it possible by moving a half-million barrels per day in internal pipelines that link the major pipelines and tanks of its 20 million barrel terminal. Enbridge's capacity has risen about a third over the past five years, but the volume of oil coursing through the jungle of pipes, valves and tanks that connects suppliers from as far away as Alberta’s oil sands to the Gulf of Mexico refiners has quadrupled. “We are fuller than we have ever been,” Moeller told Reuters. Customers tell Enbridge every month how much crude is coming, but Moeller and his team leave some space at the top of each tank that might be needed in an emergency. 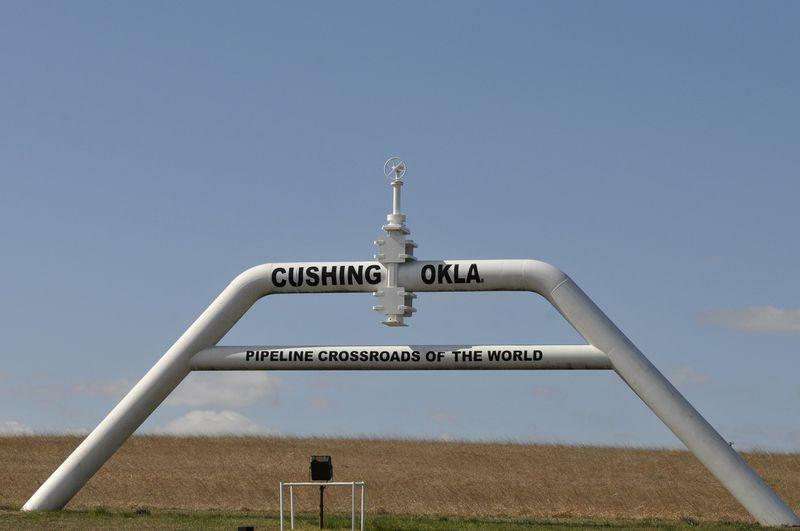 Every day, up to 6 million barrels of oil flows through Cushing's 13 major pipelines in or out of steel tanks – some the size of a football field - towering above the prairie otherwise studded with ranches and nondescript residential neighborhoods. The U.S. government estimates their operational limits at around 83 percent of their ‘shell,’ or design, capacity. In reality, the limit may be somewhat higher. Moeller says Enbridge can fill its storage space up to 85 percent capacity thanks to maneuvers orchestrated from its control room. One is shifting crude into and out of "condos" - tanks where capacity is leased out to multiple companies and crude mixed together, leaving the operator to track the exact volumes each has on hand. While all storage space is rented out, its actual use can vary in a 12-hour period, Moeller explains. Enbridge has also increased the number of connections to the other 13 Cushing terminals, circumventing valves that can curtail how much crude can be moved to large pipelines. With oil-flow acrobatics getting exceedingly complex, workers can ill-afford any lapse in concentration. The lights in the control room building get dimmer or brighter as the day or night progresses to keep workers alert through their shifts. An exercise bike is on hand if their energy starts to wane. Moeller, an Enbridge veteran of more than 15 years, arrived in Cushing in 2012 when the shale drilling and pipeline boom opened the latest chapter in its history as an oil town. It started in 1912 when an oilman named Tom Slick discovered the area's first crude. While production ceased in 1920s, the town, halfway between Tulsa and Oklahoma City, has served as a storage location and in 1983 was picked as the settlement point for the West Texas Intermediate futures contract. The shale boom and the rapid rise of the Canadian oil sands industry transformed Cushing from a way station for imported crude headed to refineries in the north into a blending hub for light and heavy oil moving south. "People joke that our crop is pipelines," said Sam Withiam, a local lawyer and landowner, whose 1200-acre (485.62 hectare) elk ranch comes up to the fence line of one of the oil storage terminals. Pipeline right of ways cross his land, and even more are on the way in, he said. As a lawyer, he has guided businesses trying to expand in this town of 7,826 that happens to be at the center of the oil world. Cushing's terminals operated by Enbridge, Plains All American , Magellan Midstream Partners, Rose Rock Midstream LP have hundreds of employees and contractors on the ground, according to the town's chamber of commerce. Market estimates of current storage rates suggest the tanks can bring over $500 million in annual revenue. To get timely estimates of Cushing's storage levels, energy information provider Genscape flies twice a week a helicopter over the tanks with an infrared camera onboard. It has registered some decreases in recent weeks, but Brian Busch, Genscape's director of oil markets and former oil trader, calls it an operational variance. "There's no reason to unwind a hedge yet," said Busch, adding the observations do not support yet some traders' view that crude prices should start recovering soon. One cannot see the vast tanks from Cushing's Main Street, a typical thoroughfare with auto parts stores, diners, fast food stops, a Walmart Super Center and Best Western Plus hotel. Yet there is ample evidence that the fortunes of the town and the global oil industry are closely connected. The Lazy-L motel, which rents rooms for $39 a night, did a brisk business peaking in 2013 when oil fetched over $100 a barrel and new pipeline construction was under way, bringing in contractors from Texas and Louisiana. Now, a single room is rented to a local security worker. House rents have fallen too from $1,000 a month just over a year ago to about $600 today. "It's always boom or bust - Cushing is strictly an oil town," said Kay Koble, a realtor who has lived in town for 60 years.